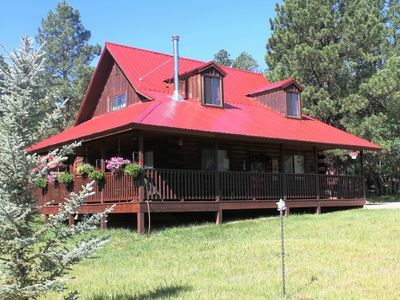 Sleepy Bear Lodge is a private home nestled at the edge of the San Juan National Forest. 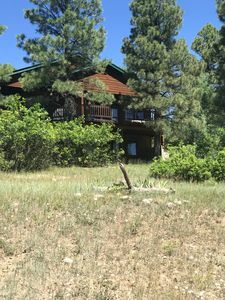 The exterior of the house features an eight foot wide full wrap around covered porch, a concrete double drive way can easily accommodate 2 cars, an additional covered porch on the back of the house and storage building near the driveway may be used for storage, ski’s or other outdoor recreation items. 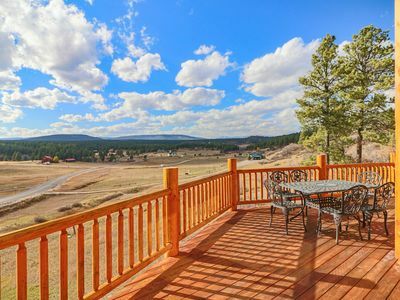 The yard to the east of the house is part of our property, which is a double lot and the views are magnificent. Coyote Hill rises to 8400 feet to the Northeast. 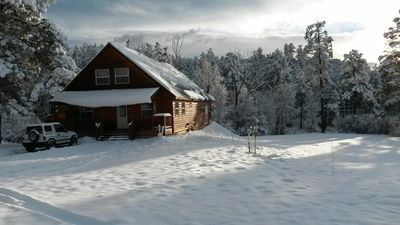 Only about thirty minutes from the Continental Divide, Wolf Creek Ski Area and Williams Lake, the cabin is adjacent to the Turkey Springs Recreational area of the Weminuche Wilderness--which offers trails for Snowmobiling ,Sledding, Nordic Ski, Snowshoeing, Hiking, Hunting and even fishing on Hatcher Lake. Guests may purchase an inexpensive pass for fishing. No license is required as this is a private lake owned by the homeowners association. 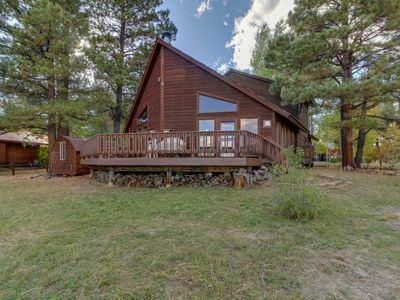 The house is very private and sits on a quiet cul de sac that backs up to the National forest. 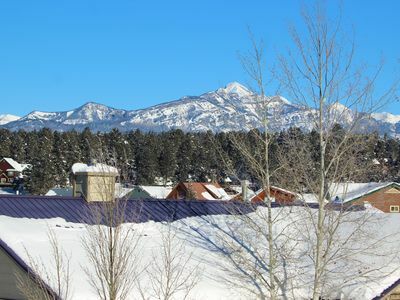 From our property you can glimpse the San Juan Mountains and Pagosa Peak rising to 14,000 feet. 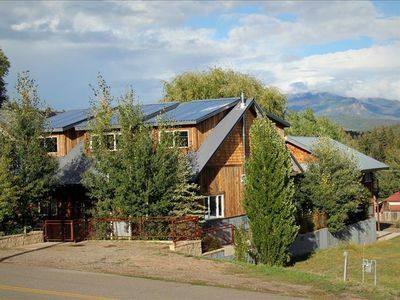 Walking in the neighborhood you will see the San Juan mountains with glorious sunsets and sunrises. Wildlife abounds in this area with herds of deer and elk. Wolf Creek Ski Resort annually receives the most powder in Colorado. 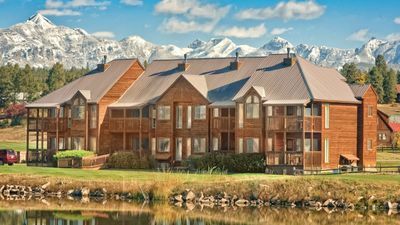 (All of your ski supplies may be rented at Wolf Creek or in Pagosa Springs but housing for the resort is in Pagosa Springs there is no housing at Wolf Creek). The roads to the cabin are cleared by the home owners association and the two major county roads serving our neighborhood are also kept clear in the winter. 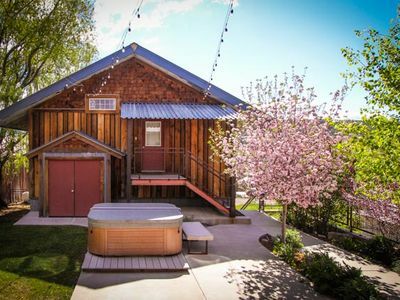 When you are tired of hiking, fishing or skiing guests can go for a soak in one of Pagosa’s famous hot springs. If you haven’t had enough physical activity our guests can (for a small fee) use the recreation center maintained by the neighborhood association. It features an Olympic size indoor pool and work out facilities. 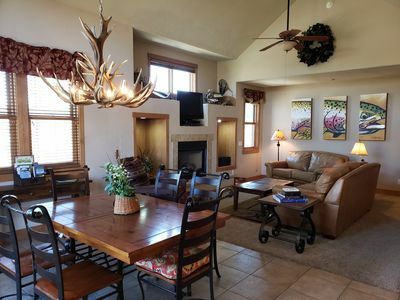 Guests will find the interior of the house comfortable, cozy and pleasing to the eye with appealing southwestern and mountain décor throughout the house. Large paintings are prints from the Gilgrease Museum collection. 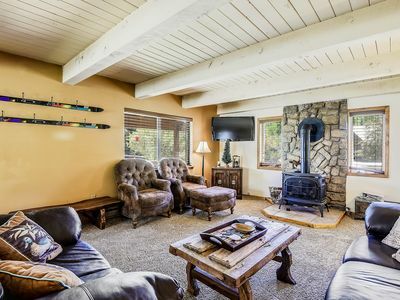 Wall hangings and other mountain decor were purchased in shops in Durango, Montrose and Pagosa Springs Colorado. All of the furniture was purchased locally in the fall of 2012. Four bedrooms will sleep 10 in beds with room for 5 downstairs and 5 upstairs. There are two King beds upstairs plus twin bed. A King bed, a trundle bed (which sleeps two) and a single twin are located downstairs. Twin beds are great for kids but large enough and comfortable enough for adults. All beds, pillows and linens are new purchased in the fall of 2012. All are equipped with new fleece or wool blankets. Home has three full bathrooms with two downstairs and one upstairs. Downstairs baths include one with shower only and one with tub and shower combo. Upstairs bath is a tub and shower combo. Bath, hand towels, wash cloths and bathroom carpets are new purchased in the fall of 2012. Guests may use the soap provided or bring your own. Shampoo not provided. A hair dryer is provided located in a carry basket upstairs. 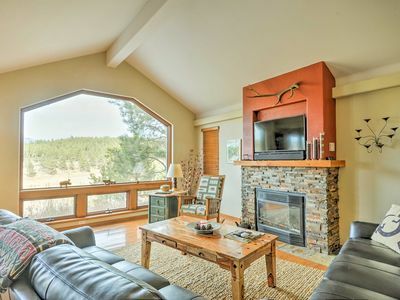 The living area features rich wood floors, wood beams, and aspen walls a new full size couch, two wing back chairs, two hassocks, new carpet, 50 inch flat screen HDTV, dish satellite channels, comfort throws, pillows and a wood burning stove with plenty of firewood. 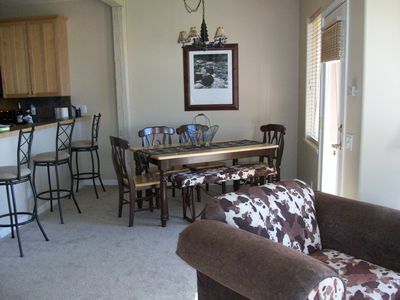 A breakfast nook at the end of the living area is across from the kitchen with seating for four. Upstairs there is a second TV room with seating and a 42 inch flat screen TV. There is a desk surface in both of the dormer windows upstairs. High speed internet is provided and a microcell phone booster for cell phone use. There is no land line phone. This fully equipped kitchen features luxurious cherry cabinets, Kenmore appliances and has all the cooking utensils and flatware guests need to cook a full meal or prepare a light snack. Coffee maker is new and coffee (both decaf and regular) are available for guests. Condiments are provided (sugar, salt and pepper, catsup, mustard). Guests can purchase groceries at the full service local market. 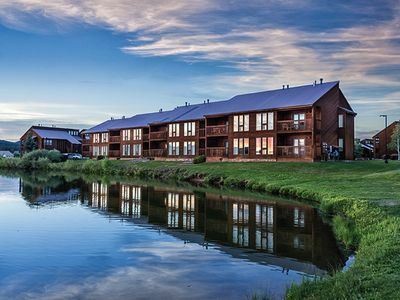 For those who don’t want to cook Pagosa has many quality restaurants. A separate dining room provides seating for 6 to 8 and features a handmade Amish Oak table and chairs and a parquet oak floor. Just off the dining room are a full size washer and dryer and a pole to hang clothes to dry if needed. Guests may use the detergent and fabric softener or bring their own. 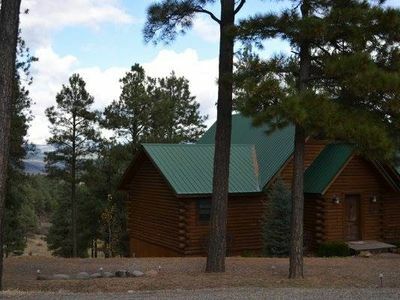 'Happy Trails' Pagosa Springs Home Near Stables! 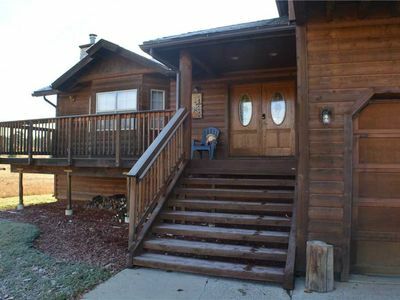 Large, family-friendly cabin w/ game room & wraparound deck - walk to lake! New Home for Rent! Amazing Peak Views. 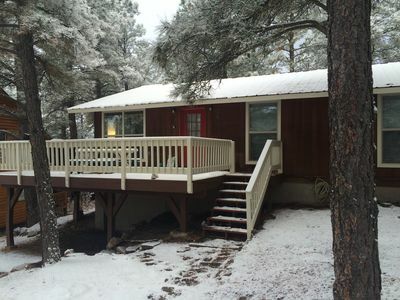 2 story, 2 Bed/2 Ba Home. 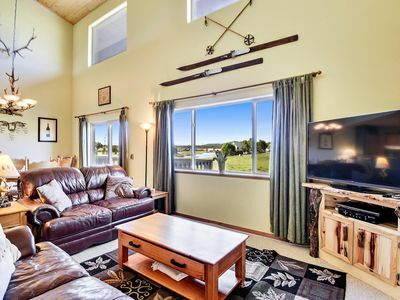 Relax with on-site golf courses! 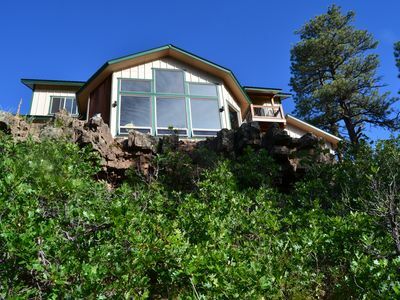 Pagosa Springs: A Mountain of Outdoorsy Adventure!